Intended as a means to keep our loyal alumni up to date with the activities and accomplishments of the college and all of its components, MomentUM actually appeals to a far broader audience. Insightfully written and beautifully photographed articles provide the reader with an entertaining and informative look at the impact AGNR has on Maryland every day. The challenges put forth to establish a healthy food system and ensure global food and nutritional security are substantial, and the college is committed to tackling them head-on. 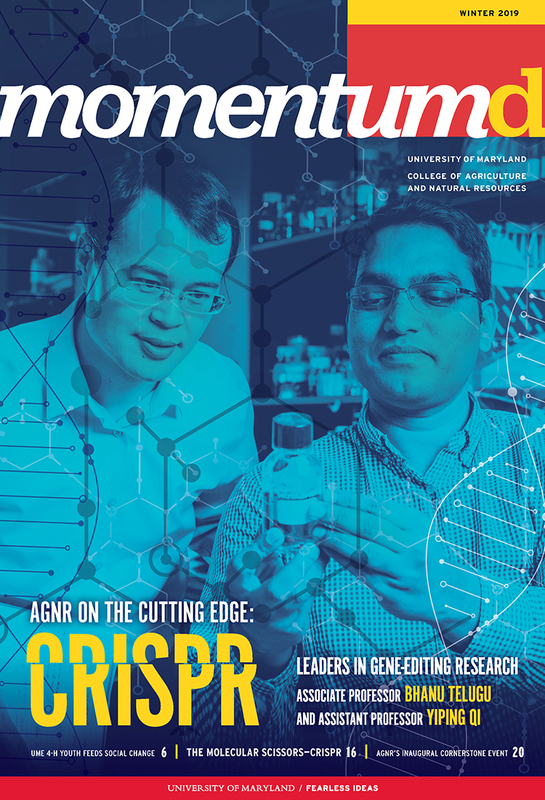 In this issue, we invite you to explore our research utilizing the groundbreaking CRISPR technology, a century of service from alumni Vernon Foster, a senior dietetics student challenging his fellow students to cook smarter and healthier in just a matter of minutes, and so much more. We hope you enjoy the experience! 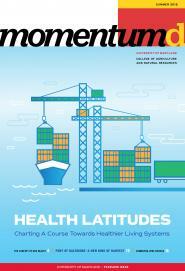 Explore the concept of One Health in this issue, highlighting research at the Port of Baltimore producing sustainable energy, our efforts to combat Lyme disease, our international work in Liberia with ROOTS Africa, and more!